It's time to begin your Container Home Project! Compared to convention construction methods, they offer bold aesthetics, are potentially faster and more cost-effective to build, and serve as an environmentally friendly adaptive reuse. Whether you want to do-it-yourself or hire a builder, there is a lot to consider with a container home project. It's probably fair to say, “You don’t know what you don’t know”. You may have already searched for information online and ended up with a mix of low-quality and contradictory data. These days, anyone can put together a website, and social media is full of well-meaning people with bad advice. 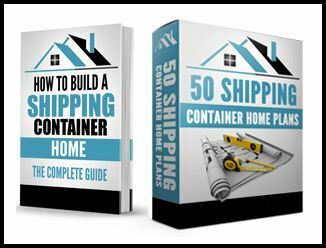 With the right resources at hand, you’ll have the confidence and know-how to build or buy your own shipping container home. We're here to help ordinary people build extraordinary container homes! What format is the guide in? The guide is provided as a PDF file. Almost all modern electronic devices including computers, tablets, and phones can access it. At this time we do not offer hard copies of the guide. After completing your purchase, you will receive an email with a download link to the guide in a matter of minutes. If you don’t see the email, try checking your spam folder. Do I need to be a DIY expert to use the guide? Not at all. Of course, you will need to have some DIY know-how but the guide is fairly simple to understand and easy to use. What units does the guide use for measurements? Depending on the subject matter, measurements are provided in feet-inches or metric units. ​​Can't I just find all the information I need on other websites, YouTube, and social media for free? Do you have hundreds of hours to spend researching container homes and weighing contradictory information? Do you have the education and experience to know good information from bad? If so, you might be able to find a lot of the information in the guide on your own. But that's time you could have spent planning and building your home instead. We've compiled and researched everything for you and are proud to share it in one cohesive document. What if I don't like the guide or it isn't useful? Send us any questions via our Contact Us page. Note that these are "study plans", meaning that they are intended to help you study the individual designs and better understand how to approach space usage and overall form. The plans lack the detail typically needed for construction, which would normally be added later to suit the peculiarities of your location, regulations, and personal preferences. The plans are provided in one large PDF file. Almost all modern electronic devices including computers, tablets, and phones can access it. At this time we do not offer hard copies of our plans. How will I receive the plans? After completing your purchase, you will receive an email with a download link to the plans in a matter of minutes. If you don’t see the email, try checking your spam folder. Is it possible for me to buy just a single design? At this time, we only sell all 50 designs together as a package. Regardless of the size of your container home, there are ideas to glean from designs of all sizes. Can't I just design my own plans for free? Yes of course, assuming you have some experience with architectural drawing. However, you may need some ideas to get you started. We share tons of cool container home pictures on our Instagram profile, but there is something different about seeing actual floor plans. Are the plans ready to build? Unless you're a DIY expert or professional builder, probably not. The plans are 'study plans', and are missing things like structural, electrical, and plumbing sheets. You'll more than likely want to have a builder or engineer advise you on how to tailor the plans to the specific requirements in your area. Why are you only selling 'study plans'? Our plans sell for less than $1 per design. If you look at websites that sell traditional home plans, you'll see that plans with a bit more detail than ours typically sell for hundreds if not thousands of dollars each. Given the wide variety of locations our plans our used, and the customizations owners will likely make, we don't think it makes sense to develop and sell more complex, higher priced plans at this time. What would it take to make the plans ready for construction? The lack of plan detail gives you flexibility, but also some responsibility. You'll likely need to get structural analysis, code compliance, etc. handled by a professional. This is even more important if your area has seismic activity, significant snow, high winds, unstable soils, etc. ​What units do the plans use for measurements? All measurements are provided in feet-inches. Are the plans approved for my [city/region/country]? With the variety of requirements that exist in different areas, it's not practical for us to provide plans that are approved for everyone. If you live in an area that requires design approvals, you'll need to work with a professional to tailor the plans to the requirements in your area. What if I don't like the plans or they aren't useful? Hi there! We created Discover Containers over four years ago (prior to 2018, we were known as Container Home Plans) because of our love for the unique building styles available through shipping containers. Thanks to our passion for and knowledge of container homes, we’re honored to be able to serve you and the wider container home community. We know what it takes to build a shipping container home and would love to help on your ownership journey too! Our team has is always working hard to bring you the best information, through research, interviews, and hard-earned experience. What we’ve assembled are the most thorough and detailed resources you’ll find.